Kady McKenzie was born in a tent on a battlefield in Caffaria, South Africa, the daughter of a French mother who died shortly after giving birth. Her father, Colonel George Southwell, a Scotsman, gave Kady to the McKenzie family to raise. They immigrated with her to Providence, Rhode Island where she worked in a weaving mill. She met and fell in love with Robert Brownell, who she would later marry, but who was married at the time to someone else. When the Civil War broke out, Robert enlisted in the 1st Rhode Island Regiment, Company H. Kady wanted to accompany him but Robert would not agree to it. Kady then appealed to Governor Sprague of Rhode Island who appointed her “honorary” color bearer. Kady McKenzie thus enrolled as Daughter of the Regiment in the 1st Regiment Rhode Island Detached Militia commanded by Colonel Ambrose Burnside. Kady was only nineteen years old, but she accompanied the troops, carried the flag, and was wounded at the first Battle of Bull Run. Enlistments at that time were only for three months, and the regiment was honorably discharged on August 1, 1861. On October 17, 1861, Robert Brownell Jr. enlisted as First Sergeant, Company A, Fifth Regiment, Rhode Island Heavy Artillery and Kady once again accompanied him as Daughter of the Regiment. The Fifth Rhode Island Regiment was part of Burnside’s expedition to Eastern Carolina, and on March 14, 1862, Kady found herself on the battlefield in New Bern. It had rained and the area was blanketed in fog, making it difficult to distinguish one unit from another. According to Captain Jonathan M. Wheeler, Commander of Company A, “a report came that the rebels had flanked us, and were moving up a ravine in our rear, and on looking back saw a regiment clothed in gray overcoats and slouched hats. The command had been given to face by the rear flank when Kady rushed forward and cried out, ‘Don’t fire; they are our men.’” She frantically waved the flag, and by so doing, helped to prevent many soldiers from being killed by friendly fire. Robert Brownell was wounded and Kady rushed to his aid. She continued to nurse Robert and other wounded soldiers until Robert’s discharge several weeks later when they both returned North. After his divorce, Robert and Kady were married and resided at the New York State Women’s Relief Corps Home in Oxford, New York. In 1882 Kady Brownell applied for and received a pension in 1884 due to her wound at the First Battle of Bull Run. This was by a Special Act of the United States Congress and she received $8 per month. 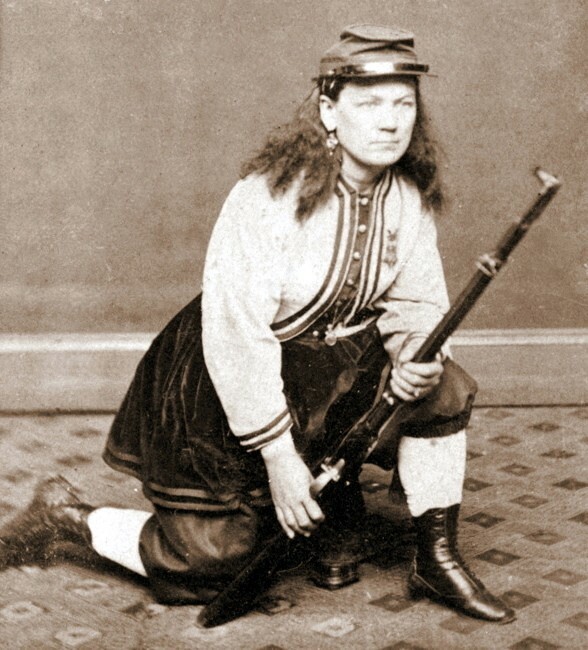 It was said that Kady was the only woman to ever receive discharge papers from the Union Army. Kady loved to make public appearances and would dress up in a French Zouave uniform, wearing her medals as well as the sword she carried into battle. She was quite popular and participated in the Grand Army of the Republic and made many public appearances at parades and events. Kady died on January 5, 1915 and is buried in Providence, Rhode Island. Kady’s story – and the accounts of others who fought during the Battle of New Bern – can be found on the interpretive panels at New Bern Battlefield Park, 300 Battlefield Trail, just off Taberna Way.